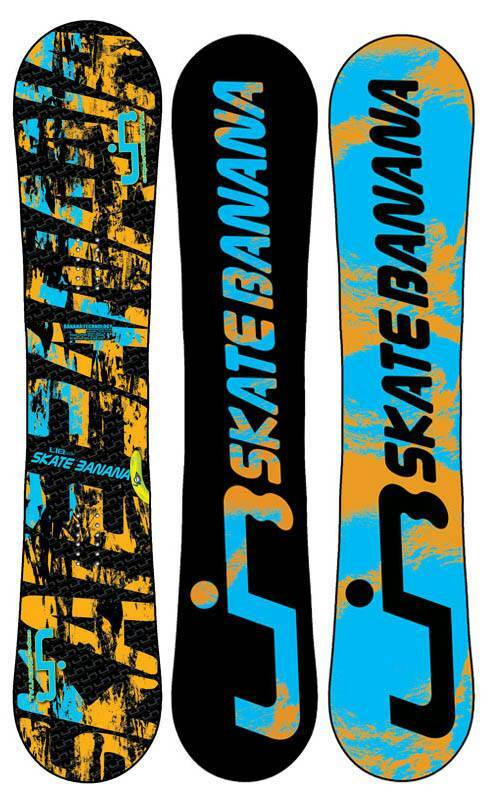 The Lib Tech Skate Banana has a loose, soft and playful feel that is not really an all mountain freestyle board but you could definitely say it’s a do anything park board. 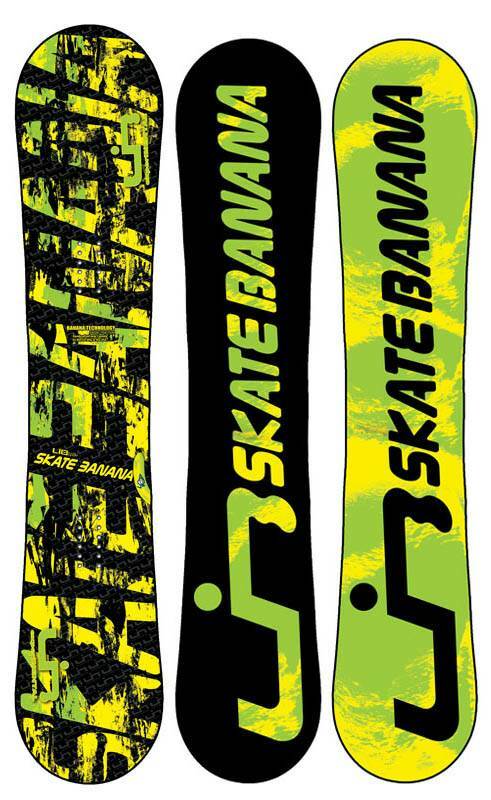 The Skate banana feels softer than its flex rating and will make a good park board for freestylers of almost any level in any condition. The same board that it’s been for the last few years and we still strongly recommend it for freestyle play. 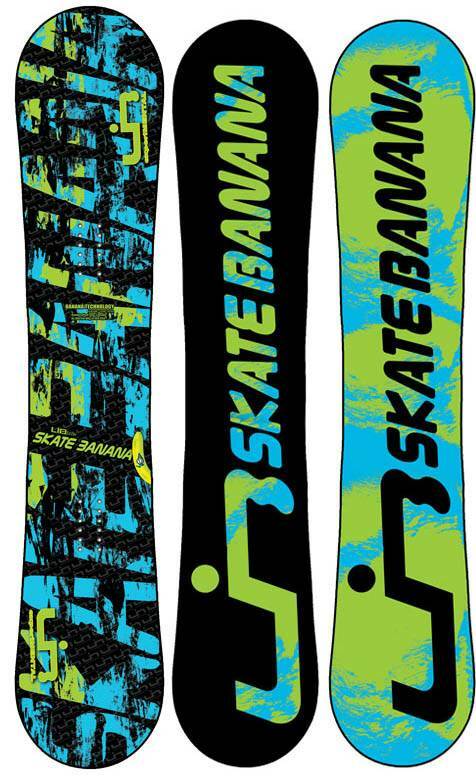 The 2014-2017 Lib Tech Skate Banana changed up the BTX profile so it’s a little different than previous models but not too much to be crazy different. It was so subtle that I didn’t even catch it at the time I rode it until Mervin mentioned it on the site. Then the more I thought about it the more BTX felt a little more stable between the feet. It still felt like a continuous rocker board compared to the C2 shapes out there. Conditions: a little bit of thick sierra pow to semi-icy snowment. 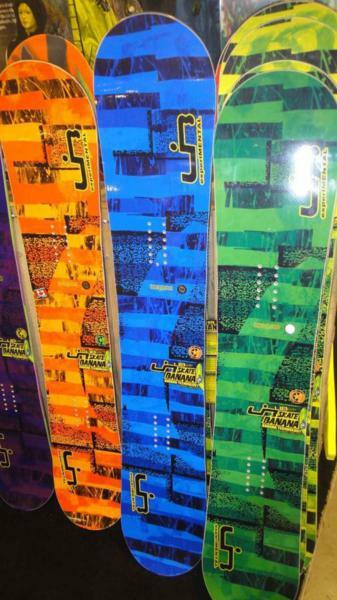 So The Skate Banana and the K2 Gyrator are the boards that started the reunion with Rocker in the snowboard industry. 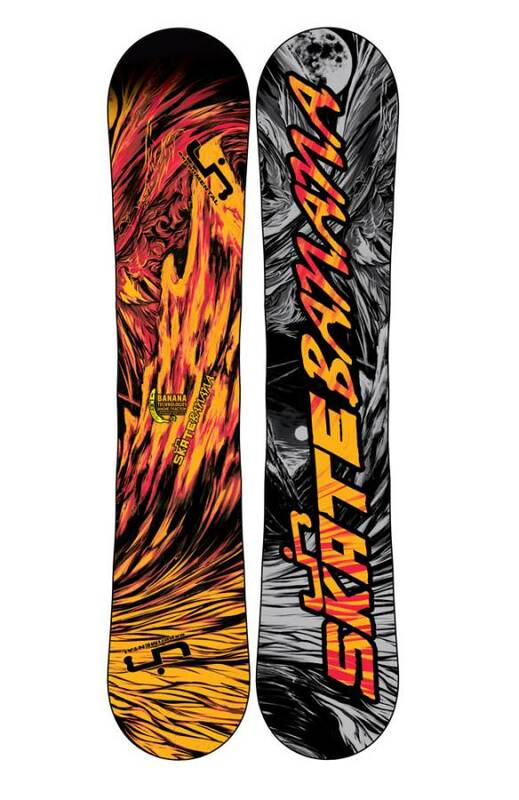 To many people, in the beginning, did not see this board for what it was but now with the evolution of hybrid camber and Hybrid rocker shapes they do know. 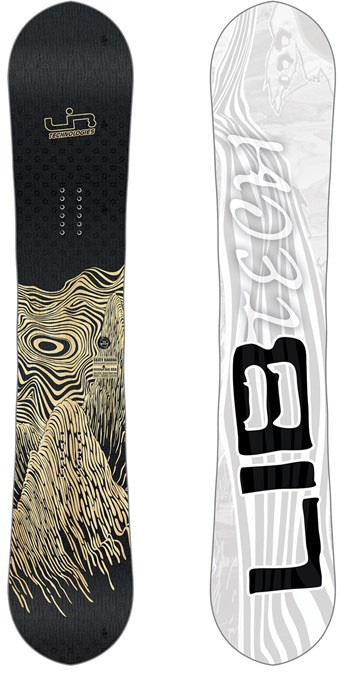 On Snow Feel: If you like to slow down and jib, butter and press around the whole mountain and then hit the park you will like this board. 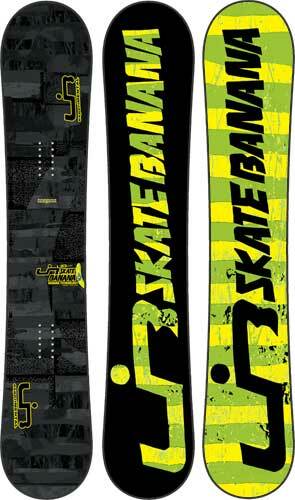 It’s a forgiving playful freestyle specific board made for riders of all levels. It’s got a loose feel between the feet that’s really accentuated in hard snow and mellows out in soft snow. 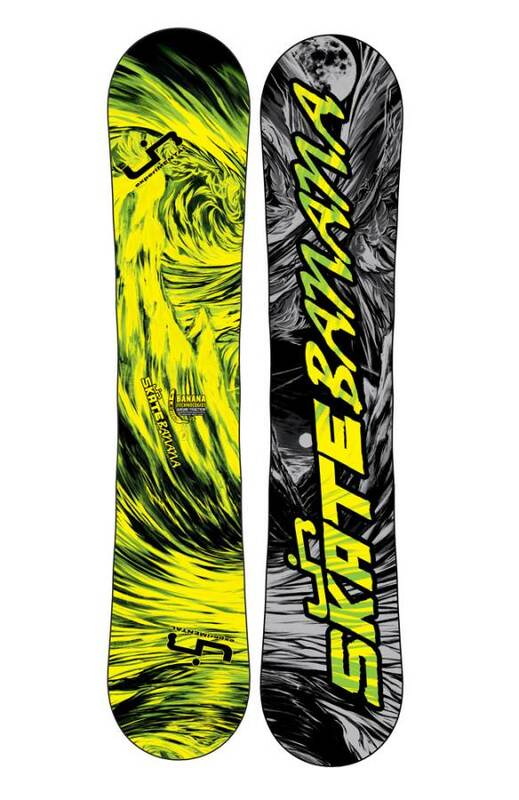 It’s very difficult to catch an edge which is why this is the kind of board I’d personally like to be on when developing my freestyle skills. Often times instead of catching an edge you just spin out. Flat basing isn’t that easy and one footing requires you to be on edge. 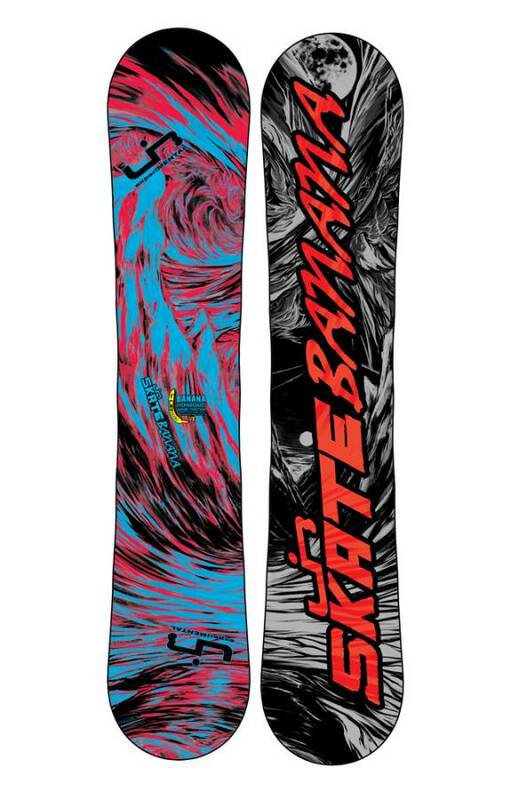 So it’s an all-rounder park ride that can also take a slow speed jib, butter, press ollie, find natural stuff to bonk on kind of ride on the mountain. 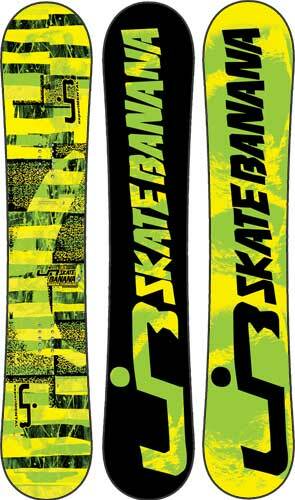 Powder: The Skate banana is not a bad powder board for those who like to hit powder switch as well as regular. It’s a twin with a centered stance so don’t expect much unless you are coming from camber. Then it will blow your mind. Turn Initiation– Very very easy to get from edge to edge. If you like a little work for turning then you won’t like this. If you don’t want to think about how to turn your board when hitting different obstacles in the park then you will love the Skate Banana. Speed: Fine for most places in the park but the chatter starts quickly as you pick up real speed on the mountain. It’s not one for flat basing because it has that loose truck skateboard feel. 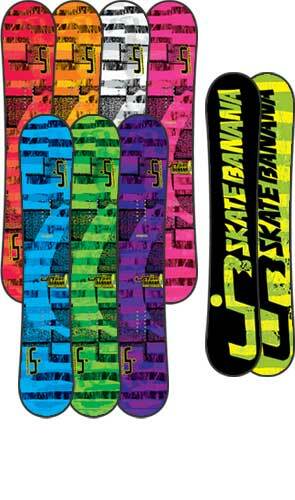 Uneven Terrain: The Skate Banana isn’t a champion of speed but it can handle bumpy uneven snow very well. 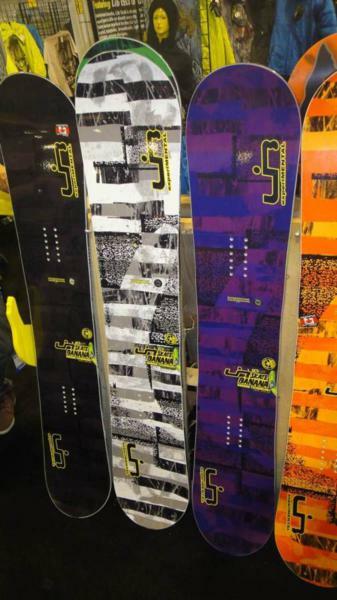 Approximate Weight– Like all Mervin boards they are made on the heavy side. You trade a little weight for reliability. Edge Hold: This isn’t the best magnetraction board out there in terms of edge hold but it’s arguably the best when it comes to a board of this flex. You can lose a little edge hold on a detune without completely losing control like you can with many jibs to do it all park boards. Flex: Softer than they say it is. It’s playful and incredibly easy to butter press and twist. Carving– This is a waste on a carve and it’s pretty washy. You can get a bit of a lean in but you can’t commit to a carve like you can with hybrid rocker boards. Jibbing– Just super fun here. If you aren’t that strong in the jib park you can take a whole new approach to it and learn a lot. If you rip then you can practice ultra technical tricks you weren’t comfortable doing in the park. 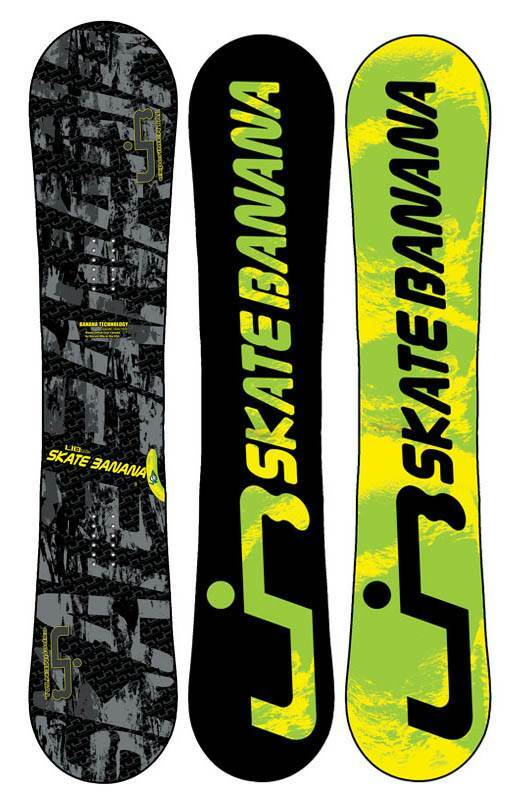 The forgiving rocker and flex make the Skate Banana a very good ride here. It’s very close to the Box Scratcher here and the jib park is one of its strong points. 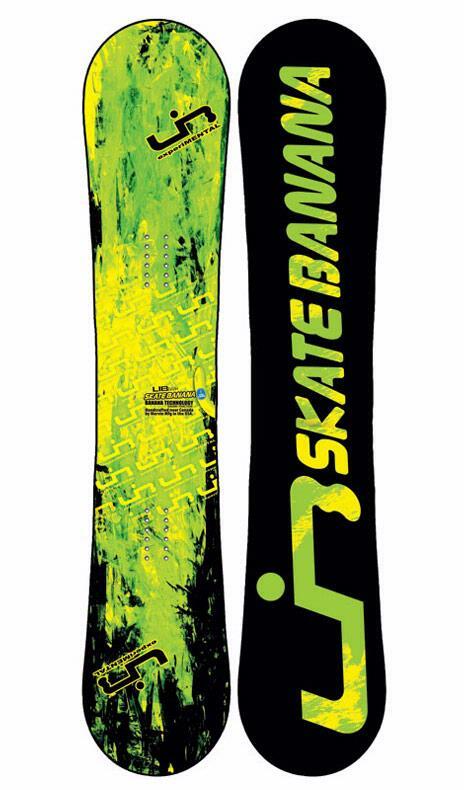 Pipe: If you keep your edges sharp the Skate Banana will perform more in the Good category but if you utilize the talents of this board for the jib park it will just be average in the pipe. It doesn’t drive wall to wall well but it holds an edge and it’s forgiving coming back down. Jumps: If coming from camber you will have a little adjustment time because all the spring is from the center of the board. Once you get used to it you have a very fun board to ollie that has a good amount of pop. When hitting most small to medium jumps you will have a great time but when they get pro size you will want something more stable and stiff. All in all the Skate Banana is one of those park specific boards that are hard to resist. It’s very playful, fun and there is a reason its still around. 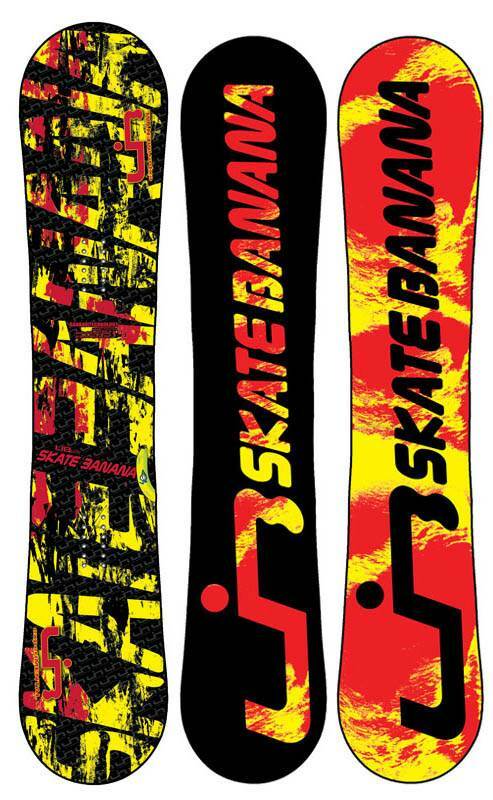 We try to get as many images of the Lib Tech Skate Banana, but forgive us if they're not all there. 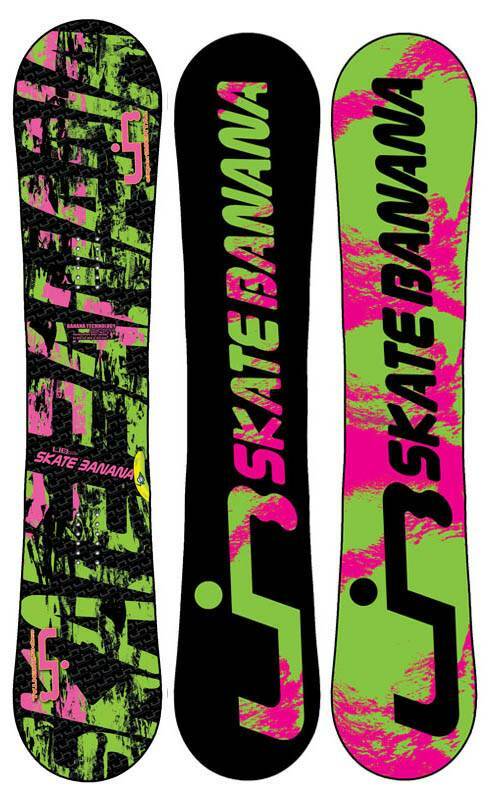 Demoed the Skate Banana while I was trying out some boards with more traditional profiles. The 154cm is a length that feels really agile for me at low speeds. I'd read somewhere on the interwebs that boards with a lot of rocker are less stable at speed but the 154 handled everything. It felt rock solid when I was going fast. (I'm light for a bloke.) The only reason (and a very personal one) that this isn't a five star board for me is the incredibly loose feeling that rocker boards have. I felt like I had less control of my speed than I had with other boards, which is really important to me on crowded pistes. 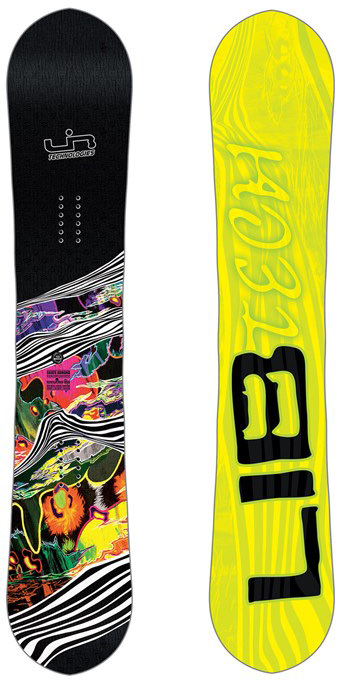 My First lib tech board, ad will always be a favorite. So many great things that everyone says about this board. Everyone mentions how playful it is and jib friendly it is as well. For rocker, its probably the most stable due to the magnatraction. Only thing i really want to point out is that this board really impressed me on the amount of pop it has. It has so much pop that it beats some of my hybrid boards. Amazing pop for being almost full rocker! The rest everyone pretty much covers. 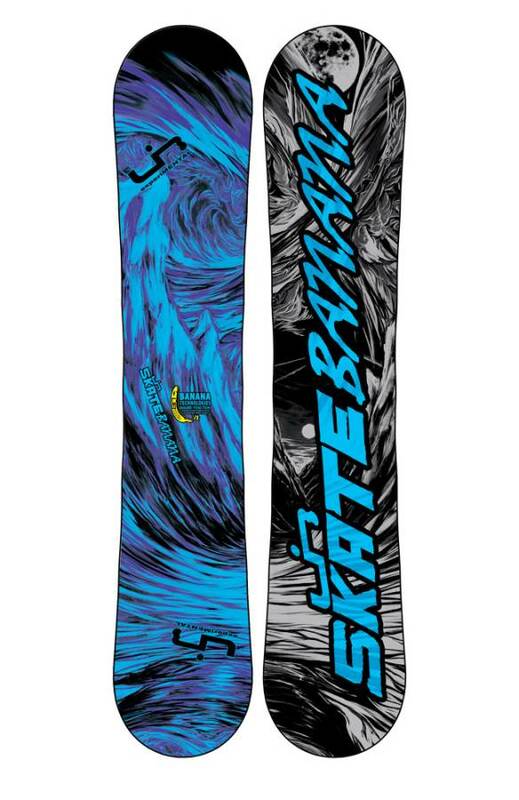 This is my first board and The Good Ride was a big part in me deciding to get this board. The Good ride reviews are accurate and the board is indeed a good choice for anyone looking for a fun playful board. 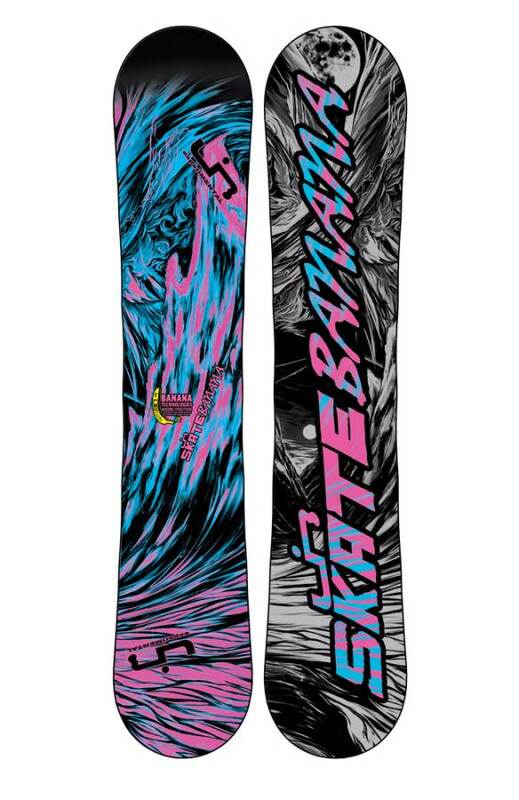 Would definitely recommend this as a first board for anyone who may not want to power down the runs but have fun jibbing and playing on the runs. This is a very fun board. Buttery soft. Can spin 360's like a spinning top. Lean back and pull easy wheelies. But when needed, the further you get on edge the better it bites in. Not bad in the pow, quite fun. 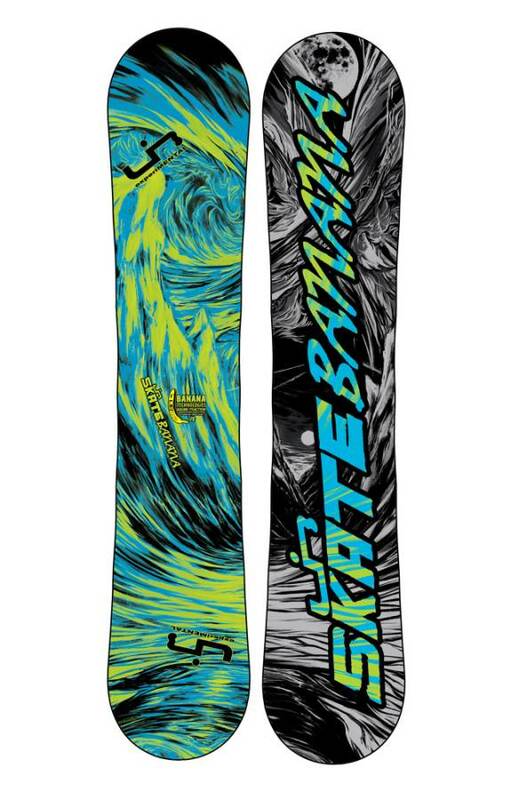 Fish would be my first choice for pow, but if you wanted to go out and grab some pow while on this board it will bring a smile to your face. Turns some tight corners also. 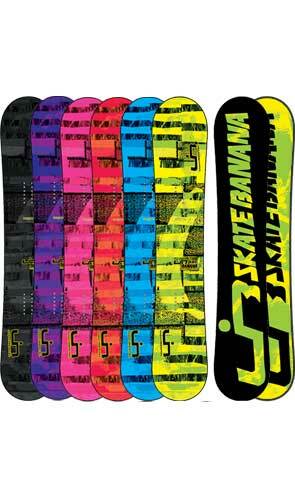 I've had a Skate Banana for a few years now and have always had a great time on it. The build quality is real solid and the Skate Banana takes a decent beating. This board seems to get a bad rap a lot, but that's more tall poppy syndrome than anything else. It's definitely no high speed charger but cruising around a mountain with mates having fun on small stuff and cruising through powder are epic days on this board. 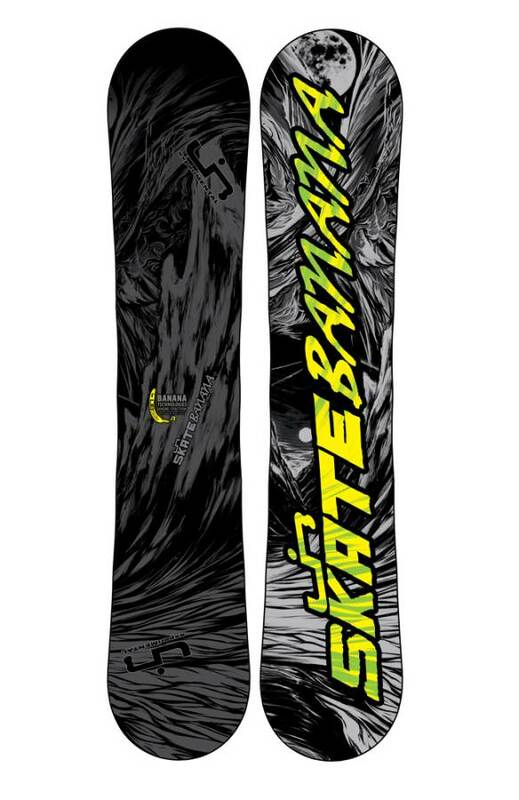 The Skate Banana never gets real good scores in powder because it isn't stiff enough to charge through it, but if you want a real easy ride through powder at cruisy speeds it is one of the best. 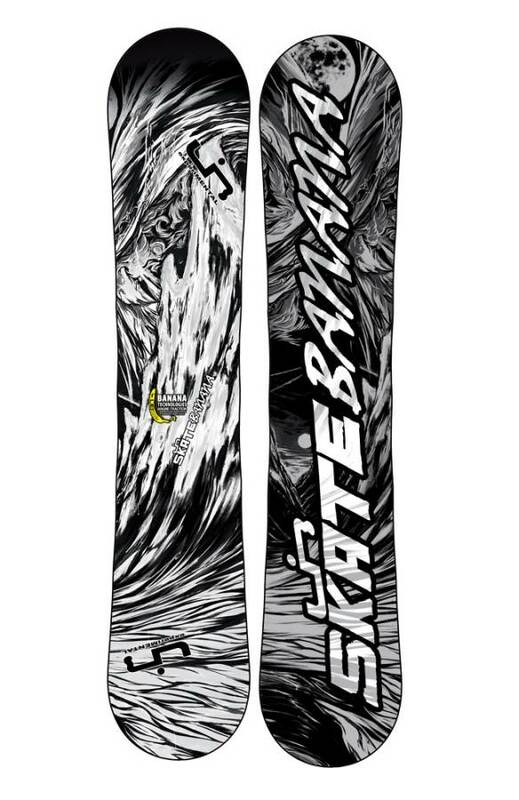 I have a couple of stiff freeride/powder boards and they are definitely better at speeds through powder and carve so much harder but when my legs get tired the banana is so much fun and floats so easily.